this is not mine, but looks nice. The drip oiler in the intake pipe looks to be factory installed . What year do you think this engine is and what hp might it be? Is it unusal not to have a makers plate? At the risk of sounding picky, that crankshaft sticks out an awful long ways and the flywheel looks much thinner than the typical flywheel on a marine engine. Are both of those features characteristic of the Detroit family? You are probably right. 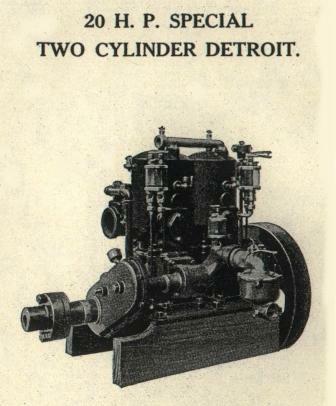 I don't think I've ever seen a two cylinder engine of the Detroit family so I have no first hand knowledge of them. The long crankshaft just looked awkward to me. I wouldn't have noticed had it not been for some recent experience with a Knox and a Gray/Dubrie that also had oddly long crankshafts. It wasn't until I got a real close look that I realized both engines had been apart at some point and then reassembled with the cranks reversed. The giveaway was the baffle on the piston, it was reversed in relation to the port. 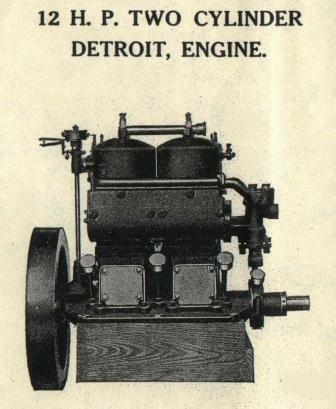 My guess would be that if it is a engine built by Detroit Engine Works then it is a very early one. 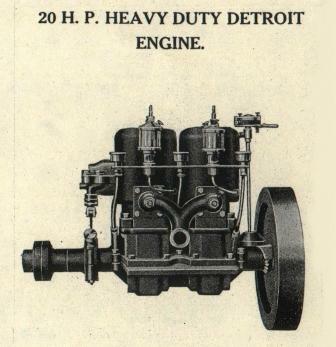 Because it has to many differences from the twin Detroit's built from about 1909 & up. From looking at the pics again the timer says It's a Gile. 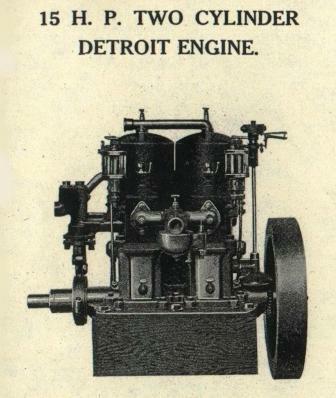 Here are a few pic's of twin cylinder marine engines manufactured by Detroit Engine Works around the 1909-1910 time period. What do you think? There were a lot of different companies that used this style wet exhaust manifold and some of the companies were not even from the Detroit area or state of Michigan. 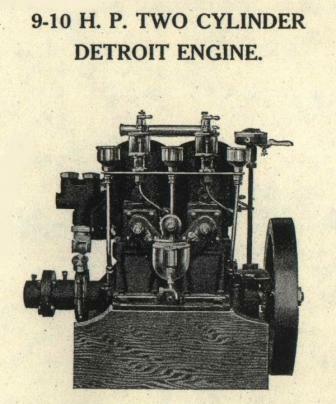 I say it is not a Detroit Engine Works or related engine but thats just my opinion and we all know about opinions. Does anyone have any literature for the Planhard carburetor thats on this twin? Apparently the carb was used on Detroit's. I would like to post the literature on my website for other collector to see.